Beeston Cemetery, Wollaton Rd, Beeston, Notts. Herbert Arthur Holloway was born in Rugby, Warwickshire in 18891, the older of two surviving sons of Arthur Robert & Eliza (née; Buffrey) Holloway. For a time following Arthur and Eliza's marriage in 1885, Arthur worked as a resident butler at Braunstone Hall, Leicestershire while Eliza and their children lived in the village. By 1901 they had moved to 18 Ellen Grove, Nottingham2, Arthur had found employment as a timekeeper and they were able to lead a more normal family life. By 1911, Arthur had found similar work at the newly opened telephone works in Beeston and the family had moved to live close-by at 90 Trafalgar Road3. Herbert, now 21 and his younger brother Frank were both working in the lace trade, Herbert as a twist hand and Frank as a draughtsman. On 27 January 1912, at Beeston Parish Church, Herbert married Edith Hulme, the daughter of George and Annie Jane (née Colton) Hulme, who was then living at 6 Dagmar Grove, Beeston4. Their son, Frank Arthur Holloway, was born in Beeston on 25 March 1913. By the time of the war in 1914, they had set up home at 112 Derby Road, Draycott, Derbyshire and Herbert was working as a lace designer5. After war was declared in August 1914, Herbert wasted little time in joining up, enlisting on 8th September 1914 with the Rifle Brigade and was posted to the 10th Battalion, in training at Winchester6. He clearly impressed as, within days he was promoted to Corporal and, remarkably, to Sergeant after just over a month's service. On 22nd July 1915, he was with the battalion when it joined the British Expeditionary Force in France and saw action as part of 59th Brigade of the 20th Division. On 30 March 1916 he suffered a gun shot wound to his leg and was passed through the evacuation chain for treatment. The wound developed an abscess and, on 26 April 1916, he was repatriated to England for further treatment at 3rd Southern General Hospital in Oxford. This was followed by a period of about a month at the Convalescent Hospital at Woodcote Park, Epsom and he was declared fit for general service on 28 June 1916. He returned to his battalion in France on 21 March 1917 and saw action during the horrors of Passchendaele and Cambrai. When 10th Battalion was disbanded in February 1918, he was transferred to 12th Battalion. On 20 June 1917, despite of - or perhaps because of - deteriorating health, he was promoted to Company Quartermaster Sergeant, a senior non-commissioned post in charge of the battalion's supplies but away from everyday front-line action. He continued in that role, in the field, until the end of May 1918 when, after a further deterioration in his heath, he was admitted to hospital. After repatriation and admission to 1st Southern General Hospital, Edgbaston, Birmingham, he was diagnosed with pulmonary tuberculosis attributed to exposure to active service and, on 26 August 1918, was discharged as permanently unfit. Sanatorium treatment was recommended with the expectation that recovery would take place eventually. Despite this expectation that he would recover, he died, apparently at home in Beeston - probably, at that point, his wife's parents' home at 6 Dammar Grove7. He was buried at Wollaton Road Cemetery, where his memorial is one of 46 in the cemetery, from all wars, which are maintained by the Commonwealth War Graves Commission. 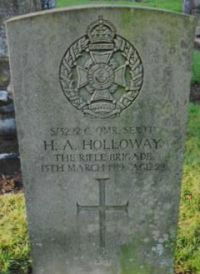 CQMS Holloway was posthumously awarded the Victory Medal, the British War Medal and the 1915 Star8. Edith lived for some time at 18 Central Avenue, Beeston but, by 1939, she had moved to 18 Central Avenue, Beeston, within easy reach of Herbert's brothers's family at 13 Dennis Avenue. She remained a widow up to her death at Nottingham City Hospital on 30 November 19509. 1His birth was registered in Q2/1889 in Rugby Registration District, Ref 6d 563. He was baptised at St Andrew, Rugby on 5 July 1889. 21901 Census - Piece 3168 Folio 57. 31911 Census - Piece 20429 RD429 SD3 ED4 Sched 66. Two other siblings had died as infants. 41911 Census - Piece 20432 RD429 SD3 ED7 Sched 205. Edith was then working as a lace pattern girl. 5Their address and his occupation in 1914 are recorded in his enlistment papers in the British Army WW1 Pension Records available on ancestry.com. 6Details of his enlistment and subsequent service are from his record in the British Army WW1 Pension Records available on ancestry.com. 7His death was recorded in Basford Registration District (of which Beeston was part), Q1/1919, Ref 7b 301. The Dagmar Grove address is a revised contact address recorded in his Service Record. 8These awards are recorded in the Medal Rolls available at ancestry.com. 9Detail of Edith's subsequent life are based in Electoral Rolls, the 1939 Registration and the Probate Calendar.